The Convicts squad has completed its three matches in South Africa, knocking off the strongest province, North West, in two matches. Early reports suggest their task then proved too difficult in Soweto, going down narrowly to the South African national side. This would be the first loss by a Convicts team - at first glance no cause for excitement amongst the Australian players but surely a good sign for the international growth of Australian Football. Tour leader Anthony Nanfra has sent WFN details of the first two matches (the final match report to follow later), as well as preliminary plans to travel to the US and Canada later in the year. 2007 is the second Convicts tour to Africa, with the group of Australian tourists/footballers following a similar program in 2005 (this author was one such player). Before he headed off on his second trip to South Africa, we asked Nanfra how he thought the touring group stacked up against the 2005 side. This of course is a difficult thing to judge based purely on player resumes but was asked so the relative strength of their opposition could be judged. Nanfra - "I rate the side just as good as last tour we have some players that were league reps for their respective leagues in 2006 and just some weekend players that are nothing special. The beauty of the Convicts is that all standards can play alongside each other. We are very confident of winning again but are keen to see how the South African players have improved. I have just confirmed a clinic on the Cape with the development officer Allison Simons. We will be conducting the clinic on Monday 7th March for 180 children. I believe it will be the first footy clinic on the Cape so I am really proud to be a part of it. As per the last tour we will be going on Safari again several times and also going to Cape Town to finish the tour". The following reports are courtesy of Nanfra. 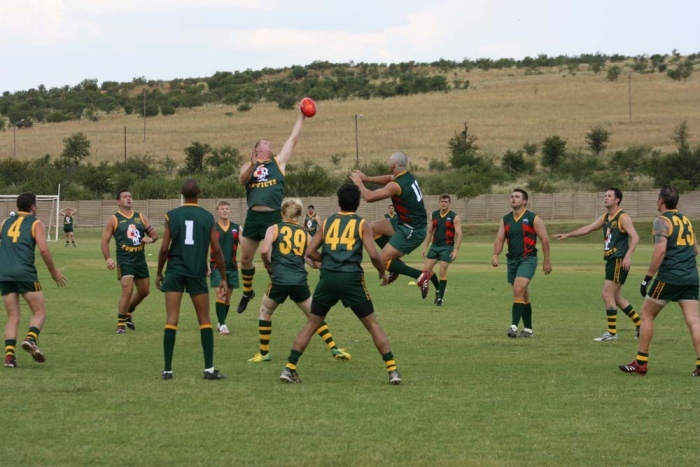 The Australian Convicts continued their unbeaten International run with a convincing 37 point win against a team comprising players from the North West province of South Africa. The Convicts lead from start to finish and unveiled some boon new recruits including Kalgoolie league best and fairest winner from 2004, Clinton Rudd. He controlled the center corridor to set up wave after wave of attack. The Convict engine room with Anthony Dhillon and Sean Millane (editor: both Convicts stalwarts) firing left the home side floundering in many stoppages and forced the opposition into unforced errors on numerous occasions. North West also had no answer to the prowess of rucking giant Dean Trawarn. North West players played better after the main break but it wasn’t enough in an often spiteful second half, Jason Chandler booting 5 goals in a superb display at full forward. The Convicts were just too good against a slightly inexperienced North West team. They now go to Mafikeng to pit their fortunes against another North West province selection in a game on Saturday. The Australian Convicts have again defeated a combined North West team by 35 points this time in Mafikeng. The game was played on a rugby oval at The Mafikeng international school on 24th February. Again it was the midfield with Rudd, Dhillon and Jamie Baker running out of half back which gave the Convicts the drive. Good work finished by a magnificent haul of 9 goals from Jason Chandler. He was unstoppable even with 2 players playing his every move. This group of North West players was much improved, many of them recently completing the South African tour of Darwin earlier this month. The game was always close with the Convicts moving away at every change. Played in really good spirits the Convicts move to Soweto to play their final game on Wednesday. Early information is that the Convicts lost their third match of the series by 7 points in Soweto. If the tour proceeded as per 2005 and per intention, the third match will have been against a combined selection representing South Africa. Although there are many possible contributing factors to the loss (such as a long tour, injuries, a friendly approach, plenty of partying the night before), until we hear otherwise, this would seem to be an excellent result for international footy, reflecting the growing strength of the Africans, who generally lost by about 10 goals in 2005. The Convicts are also planning a North American tour for October 2007, with visits to the USA and Canada. Nanfra - "I have been negotiating with both parties and they are very keen to have us over. Just finalising the details now and I will get back to you with confirmed playing dates. I have had an unprecedented demand for this tour from players it will be a sell out for sure. We are getting a great representation from all states (of Australia) this time which is great". More details will follow on WFN and The Convicts.